When my husband came home and told me that he had lost his job, I didn't know what we were going to do. In addition to living an incredibly comfortable lifestyle, I also had a lot of friends and family near that I didn't want to leave. However, after he talked with me about his job loss, I knew that staying wasn't an option either. I contacted some local movers and arranged for a storage unit, and then started packing my things. This blog is all about the intricacies of the moving process, so that you can make better decisions than I did that day. When budgeting for a local move, don't forget to include a tip. 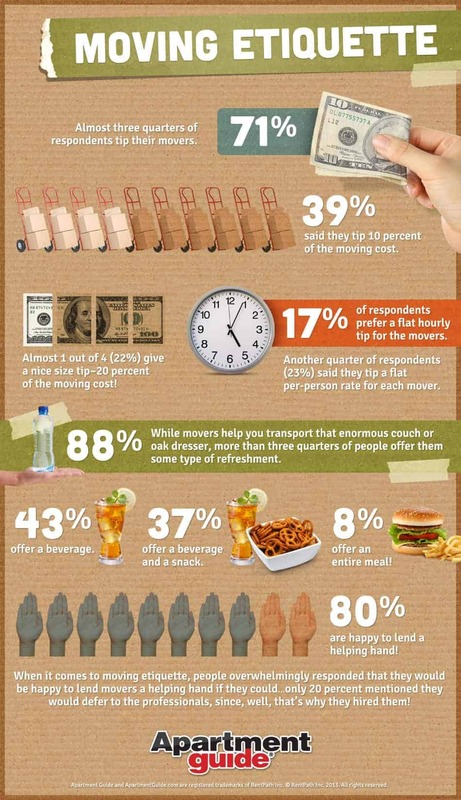 You aren't required to tip your moving crew, but most people like to give their movers a gratuity. According to an Apartment Guide survey, 71 percent of people tip movers. Since even a small tip can reach a hundred dollars or more, it's important to factor this into your moving budget if you're going to leave one. Here's a guide on how much to budget for a tip, along with some suggestions on how to give it. To see just how much a tip may add to your moving budget, consider how these methods of calculating the gratuity would increase the cost of a $1,500 local move. A 10-percent tip would add $150 to the price of the move, and a 20-percent gratuity would double that amount to $300. These amounts would be shared by the crew. For the sake of this example, assume there is a crew of six people and the move takes a full day, eight hours. A $150 tip would leave each laborer with $25, and a $300 one would give each crew member $50 for the day. No mover is going to complain about getting an extra $50 for their day's efforts. Even $25, though, is a respectable tip that breaks down to an additional $3.13 per hour for the crew members. If you were to use the other methods to settle upon an amount to tip, the gratuity might be less, but it will still add a significant amount to your moving expenses. For instance, using the above example, giving each person an extra $2 per hour would add $96 to your move's cost. A flat rate of $20 for each person would increase the price from $1,500 to $1,620. Because a tip is for the people who are moving your belongings, it should be given directly to them -- not their boss. By handing each mover a tip, you'll have an opportunity to express your thanks to them personally. They can hear in your own words how grateful you are, rather than from their supervisor. Additionally, handing out tips directly to each crew member will prevent an unscrupulous crew supervisor from pocketing the entire amount. Most people wouldn't do this, but it's best to not give anyone the opportunity to take another crew member's tip. To make sure you're able to hand out tips to each crew member, break up the amount you have into individual gratuities. If you want to tip $150 and there are six members, break the amount into 20- and 5-dollar bills so that you can hand each member $25. If you want to tip them $300 total, get six 50-dollar bills from the bank. This way, you won't have to leave the entire amount with one person until they can get change. You aren't under any obligation to tip your moving crew, but most people want to give their movers something. If you decide to show your gratuity with greenbacks, make sure to budget for the gratuity -- and get the amount you budget in denominations that will let you give each person an individual tip. For more moving tips and information, go to sites of local moving companies.